Everyone knows to visit the dentist every six months for a checkup and cleaning. But when you experience any of these symptoms you should consider making an appointment right away. This can be an indication of gingivitis, which is inflammation of the gums caused by bacteria. Left untreated, it can advance into periodontitis and put your teeth in jeopardy. A reaction to hot or cold foods may be a sign of decay in a tooth, a loose filling or an exposed root surface resulting from gum recession. It can also indicate cracks in a tooth’s enamel. Seeing blood after brushing or flossing could be a sign of an infection. Seek treatment before it develops into gum disease. If you notice an unusual lesion or mass that lingers and won’t seem to heal, it may be a sign of oral cancer. Your regular checkup should include a screening, but you shouldn’t wait for that if you have an area of concern. 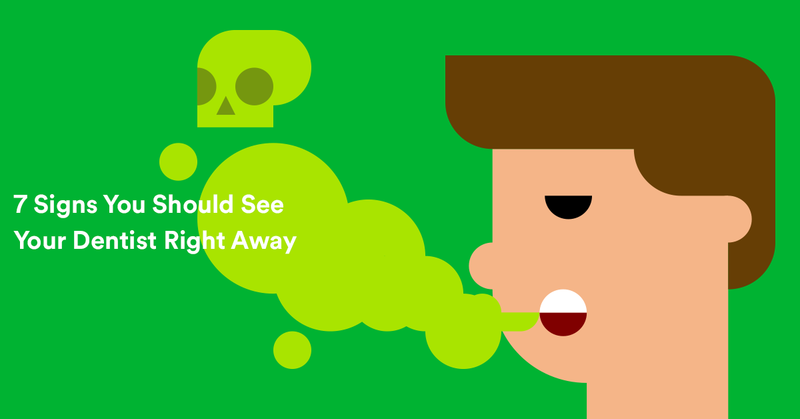 The things we eat and drink can occasionally cause bad breath. However, if you find yourself with persistent halitosis, it could be an indicator of gum disease. There are a host of different causes for mouth dryness. Everything from dehydration to allergies to side effects from prescription medication. But it can also be a sign of more serious diseases. Disintegrating teeth are typically a consequence of decay and dental disease. Teeth just don't "fall apart." There is always an underlying reason.